Seville, with its costumes, music and lifestyle, is typically how outsiders see Spain. This iconic and historic city was occupied by the Moors for many years before being reconquered by the Catholic monarchs Ferdinand and Isabella, and the influence of both remains, while flamenco originated with the gypsies of Andalucía. The summer heat and strong sun of Southern Spain is too much for some, although good use of ceramic tiles, running water (an Arab custom) and shady palm trees is a help. Go when it’s cooler in April for the Feria’s daily display of local society, the horse-riding, the dressing-up, and of course, the partying; or arrive two weeks earlier during Semana Santa (Holy Week) for a spectacular but more sombre experience. Whenever you go, there is plenty to see within easy reach and here is the TLE pick of the best hotels in this beautiful city. Heading To Barcelona? 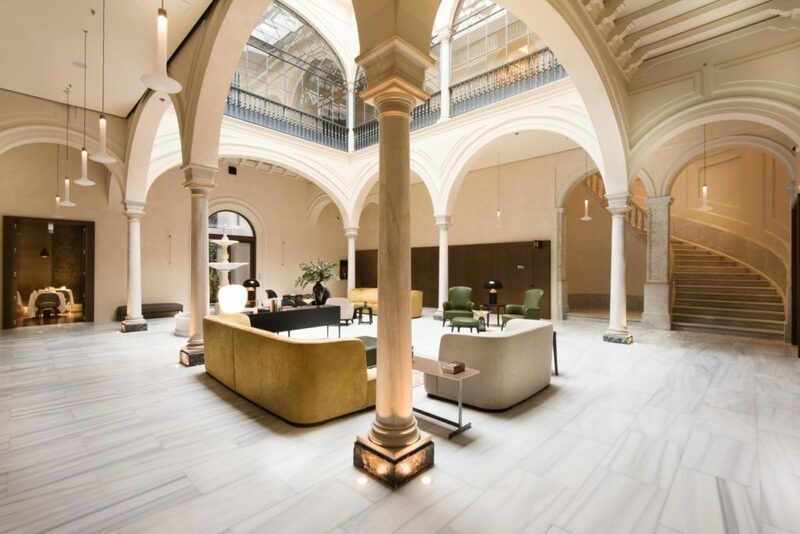 Read our guide to the best Luxury Barcelona hotels. 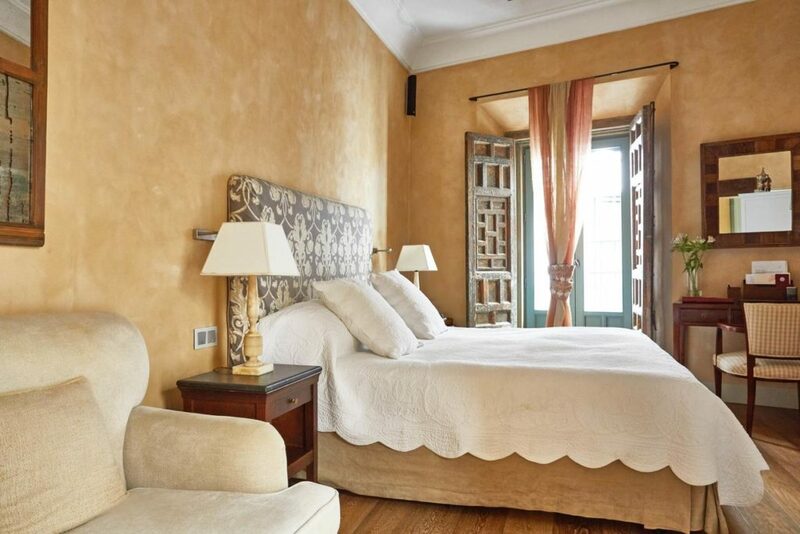 Said to be the birthplace of the poet Ximinez de Enciso, this boutique hotel in the Barrio de Santa Cruz is a short walk from the Gothic cathedral and the Alcázar palace. The seventeenth-century building has been carefully restored, and retains the typical architectural style of a central courtyard with a fountain. 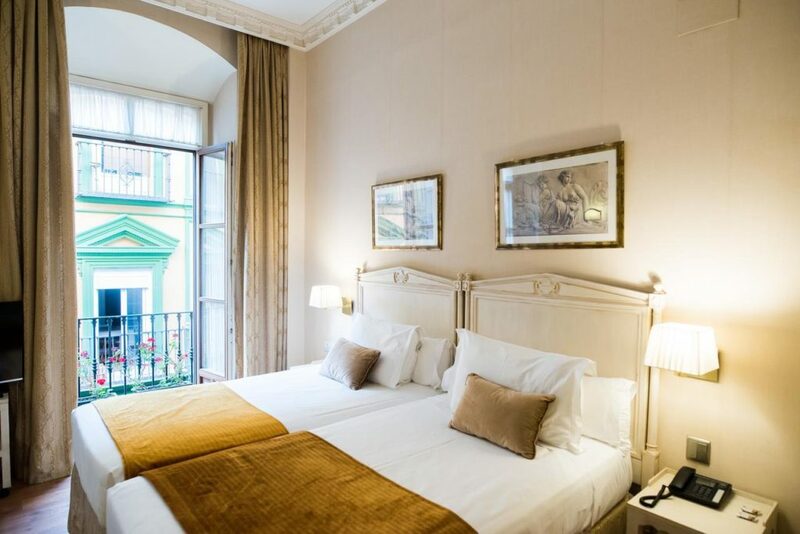 Guests can look forward to daily live guitar music, and can enjoy an art gallery and a roof terrace with views to the cathedral and its baroque bell tower, the Giralda. Rooms vary in size, with suites and duplex available, and there is also a luxury apartment. In the city where Roman Emperors Trajan and Hadrian were born, the eighteenth-century Casa Romana has been re-designed as a Roman-style dwelling on harmonious lines. Guests can choose from the extensive cocktail menu while enjoying the panorama from the roof terrace, where there is also a swimming pool. The light and airy soundproofed bedrooms offer every amenity, with de luxe options and suites available, and there is even an on-site DJ. Located in the old town, it takes around fifteen minutes to reach the burial place of Christopher Columbus in the cathedral, while the Museum of Fine Arts is a little nearer. 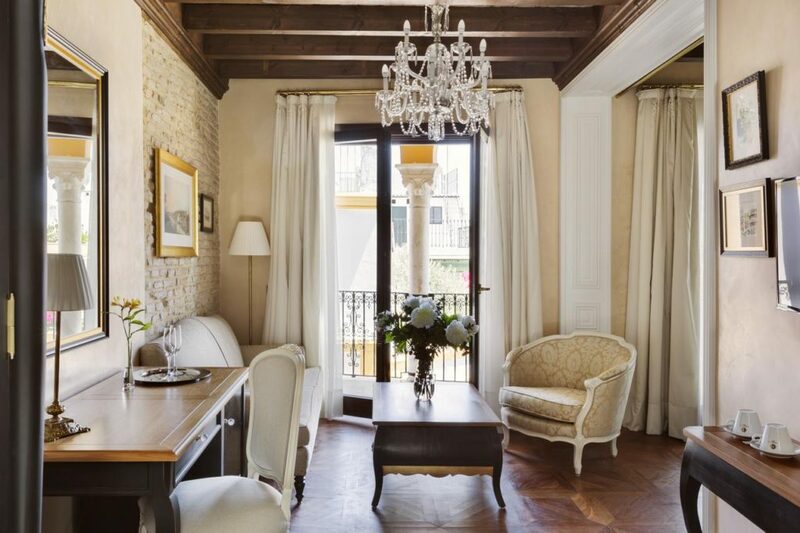 This upmarket apartment hotel sits conveniently on a street of bars, restaurants and shops, not far from the Alcázar, and two kilometres from the buzz of the Plaza de España. Each one-bedroom unit here offers two single beds that can be converted to a double, free WiFi, two smart TVs and a kitchenette, with a pull-out sofa bed in the living area. The child and pet-friendly complex is completed by a roof terrace with a pool and loungers. Limited parking and bike-hire are available, and there is a laundry service. Alfonso XIII, great-grandfather of the present king, ruled until Spain declared itself a republic in 1931, and commissioned this centrally-situated hotel during 1929’s Expo 29 in Seville. 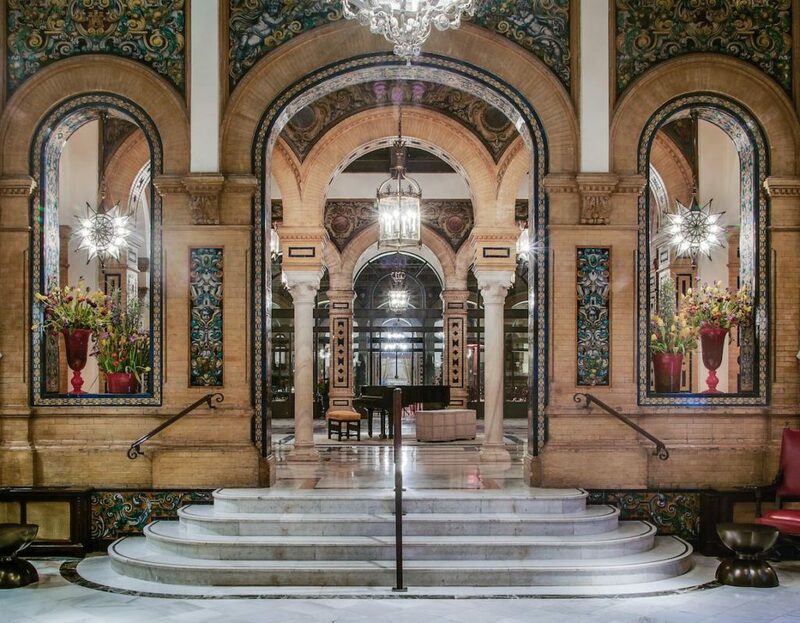 Modernity mixes with Moorish and Spanish tradition in its elegant interior and stunning facade, while dining outlets complement the meeting and function rooms. Sample authentic Andalusian cooking in the restaurant, or share tapas favourites in ENA by Carles Abellán. Meanwhile, as you might guess, the Bar Americano shakes (or stirs) a mean cocktail in an Art Deco setting. This is another converted palace with a view of the bell tower, but this one dates from the fifteenth century. Despite recent renovation, the original features and style have been respected, with rooms grouped round the central indoor courtyard, while another patio has its own well. The attention to detail continues with the care and attention that staff give to their visitors, with even kettles being provided. 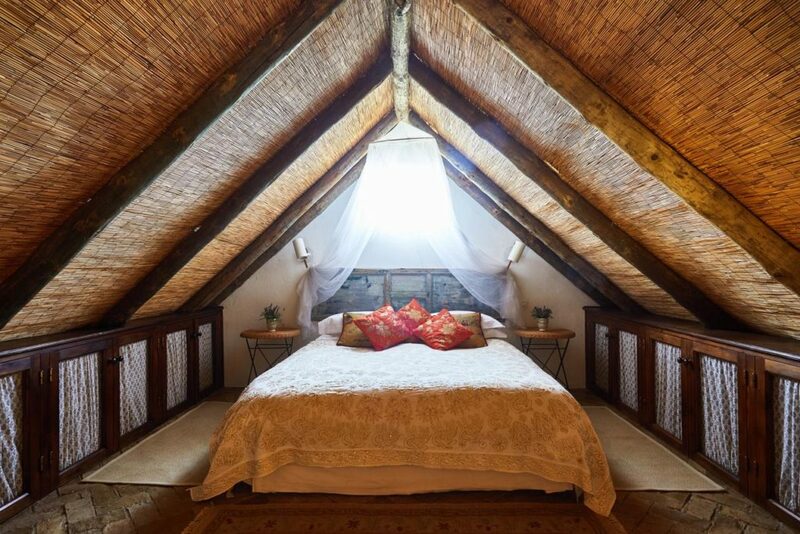 Terracotta flooring cools the bedrooms, some of which contain carved wooden ceilings; spaces range from standard double to suites, and there is disabled access. A Basque restaurant features a charcoal grill, and in another nod to that region, there’s also a Pintxos Bar. 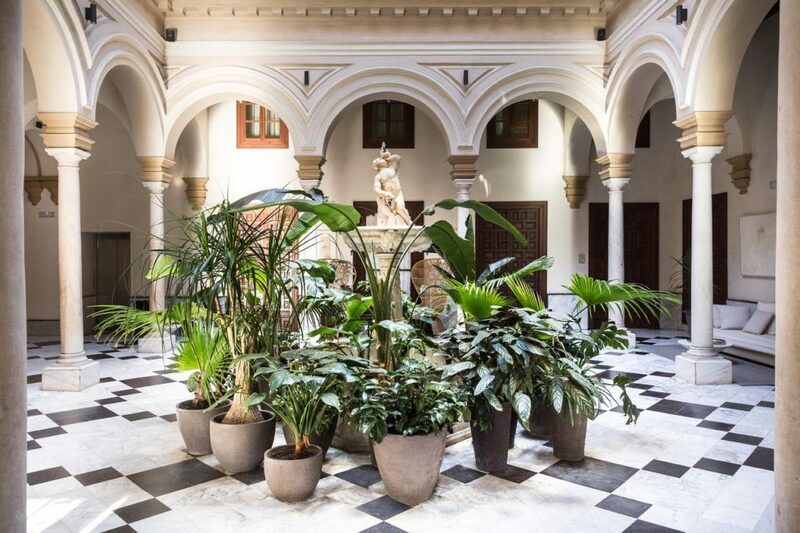 For a luxury city centre stay, in the heart of Seville’s labyrinthine old town, then choose the family-owned Hotel Corral del Rey Seville, a historic property full of eclectic, creative style and upscale elegance. 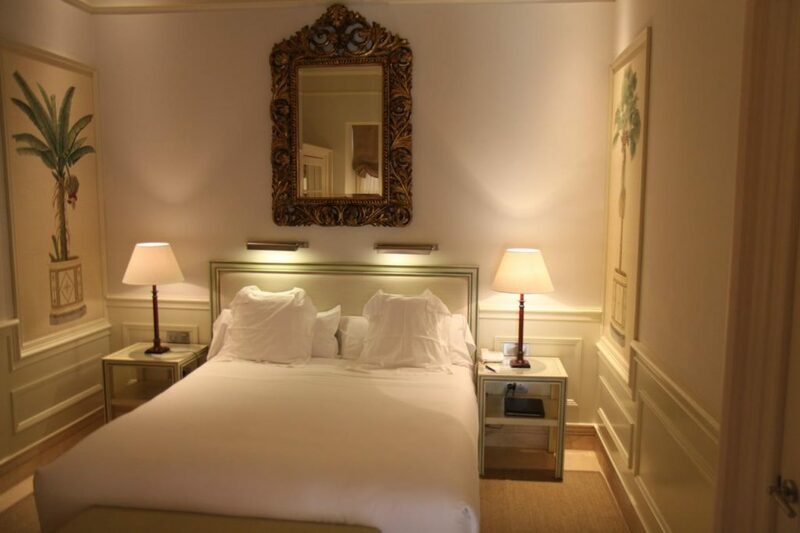 Corral del Rey is one of the most established boutique hotels in the city. 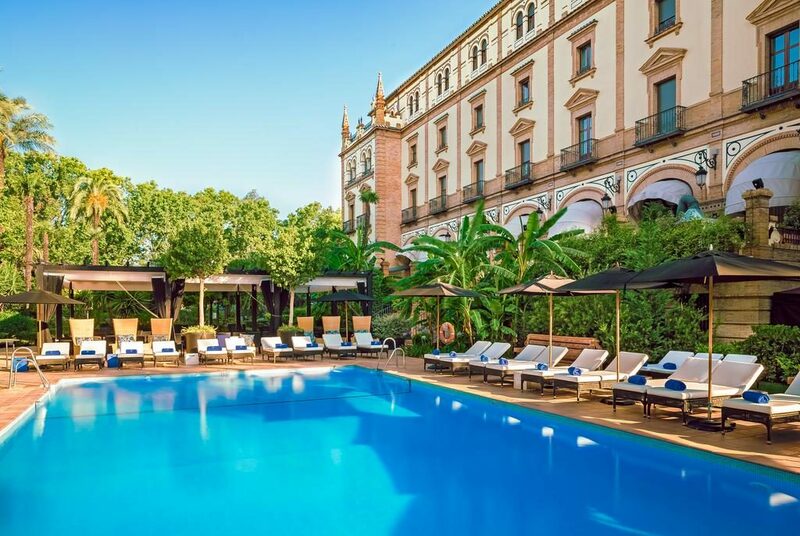 Created by a family with a consistent track-record in luxury hospitality, the property is within converted ‘casa palacios’; striking noble houses once homes to the city’s wealthy when Seville was at the epicentre of world trade with the Americas. Hacienda de San Rafael is a a classic Spanish hacienda surrounded by rural estate farmland, close to the romantic Andalusian capital of Seville. This palatial estate is a luxe Andalusian retreat. 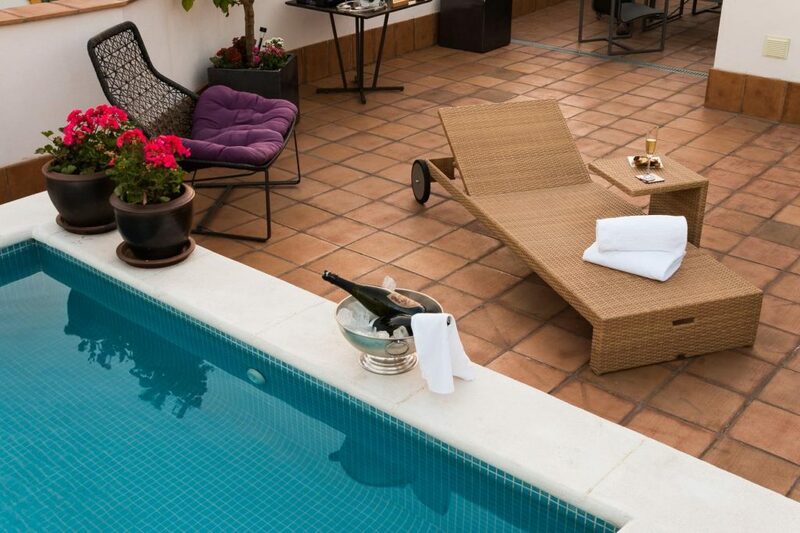 Guest rooms and duplex suites are found within the main manor house; whilst in the landscaped grounds are individual villa suites or ‘casitas’ with access to a dedicated pool. Facilities include restaurant, bar; and sports like tennis and padel, as well as swimming pools, yoga and massage. 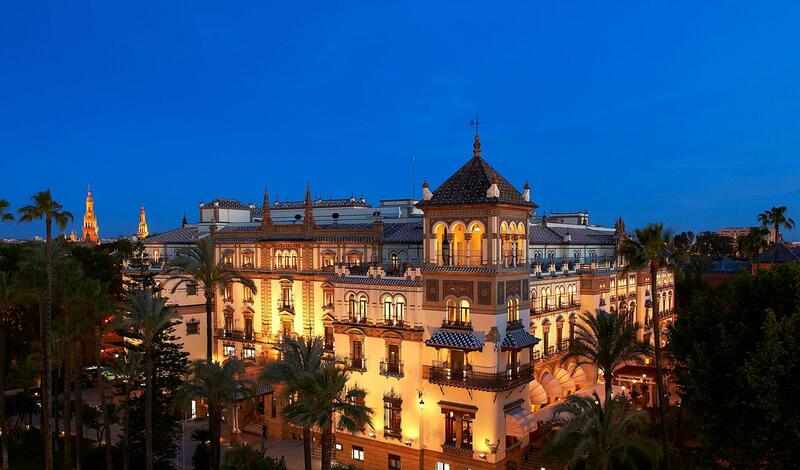 Activities on offer embrace horse-riding, cultural tours to nearby cities such as the sherry wine city of Jerez, and Seville, the capital of Andalucia.